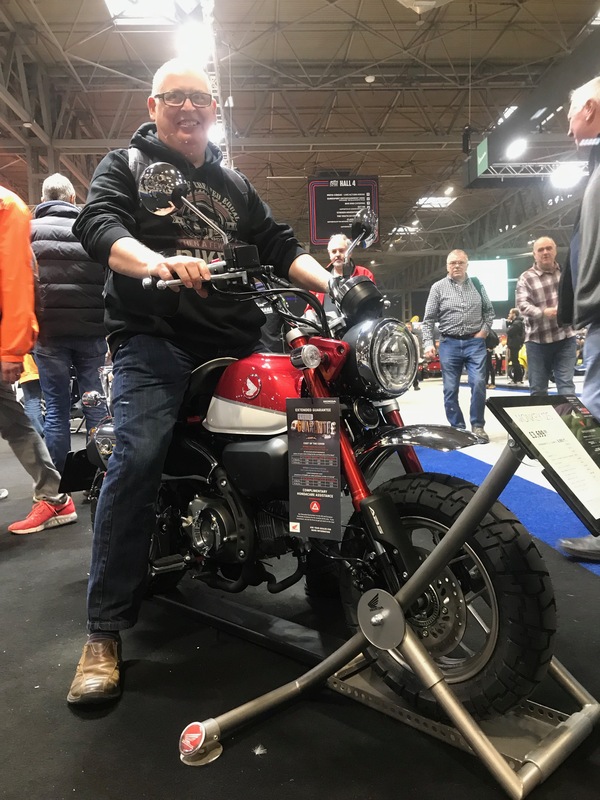 Phil, David and I went to the MotorcycleLive show at the NEC Birmingham this week to have a look at the new bikes coming onto the market next year, in particular the new adventure bikes. 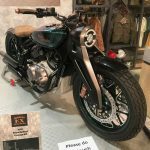 There were a lot of exciting motorcycles there, the new CCM range of modern retro bikes look particularly interesting as does the new Royal Enfield 838 Concept KX. 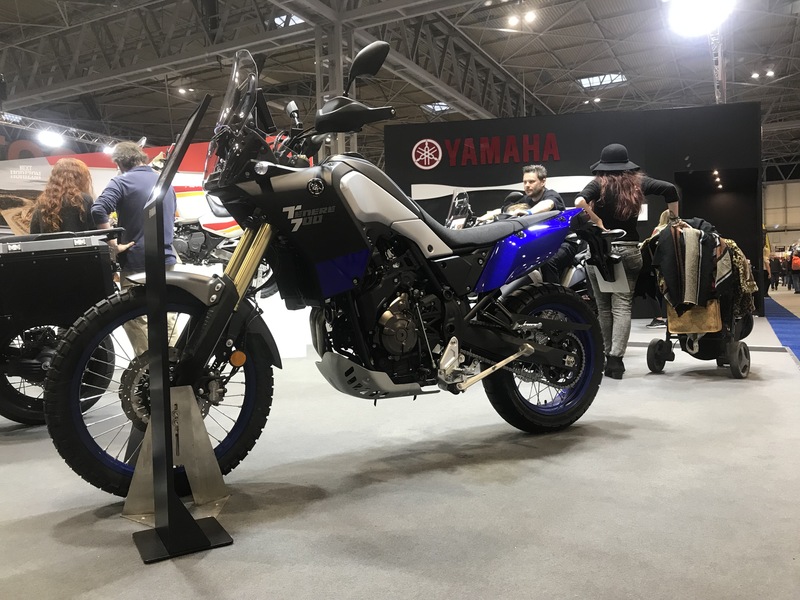 The first of the new adventure bikes that we took a look at was the new 700cc Tenere from Yamaha. It looked really well put together in its blue, white and matt black livery. 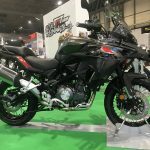 The new upside down forks are an improvement on the old 660 Tenere as is the MT-07 derived 700cc parallel twin engine. Climbing onto it, and it is a climb, the seat is firm but comfy with great presence. The new LCD dash looks interesting but wasn’t on so we have no idea what the display actually looks like. Ground clearance is excellent as is pretty much every thing else on the bike with the only problem being seat height. Once on board my feet were a good 6in from the ground, much to everyone’s amusement. 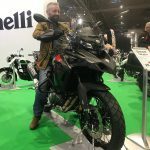 My XT660z Tenere was tall but I could get to the ground, just, but this new Tenere is considerably taller making it impossible for me to ride. A theme that kept coming up throughout the show. 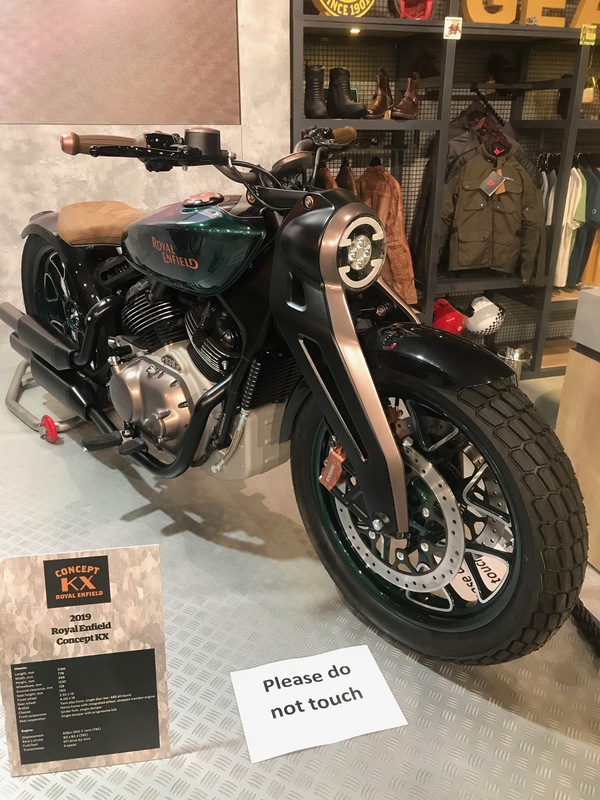 We stumbled across the Fantic stand where we spotted the new Caballero 500, a 450cc single cylinder scrambler type bike. 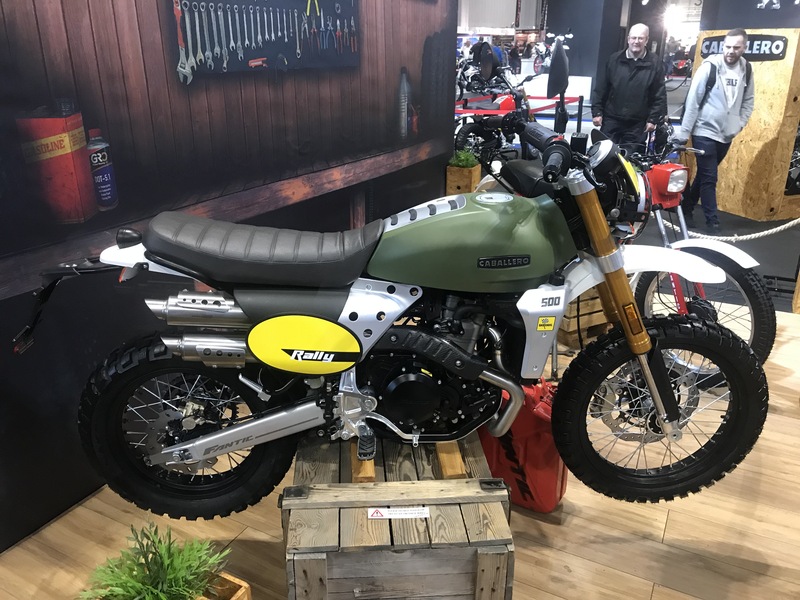 It’s well spec’d and looks really cool with it’s twin pipes, upside forks and retro scrambler styling that seems to be the rage at the moment. Both David and I could see us doing some sort of trip on one of these bikes some time in the future. 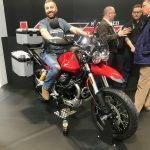 The BMW stand was of particular interest to us as the new F850GS is one of the bikes we were looking forward to seeing for the first time. 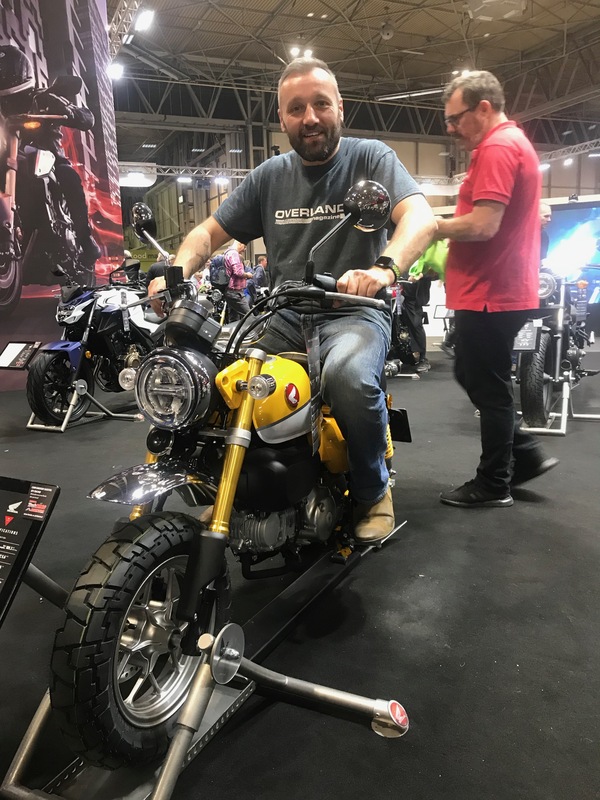 There was also an excellent riding demo of the new R1250GS, I’ve no idea who the rider was but he had total control of the machine and made it look a breeze to ride. Getting back to the F850GS the first thing that surprised us was the sheer presence of the bike. From the front it looks huge with a vast amount of plastic that would almost certainly get smashed to bits in no time on our travels. Plastic galore seems to be the thing on a lot of adventure bikes today, all of which would require some pretty hefty crash bars to protect. 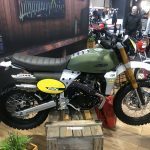 Once again I struggled to touch the ground on the 850GS and certainly wouldn’t consider taking it off-road as I could never get my feet planted on the trails should the need arise. As always, the build quality of the BMW was excellent, seat was firm but comfy and overall riding position was excellent, such a shame it was so tall. 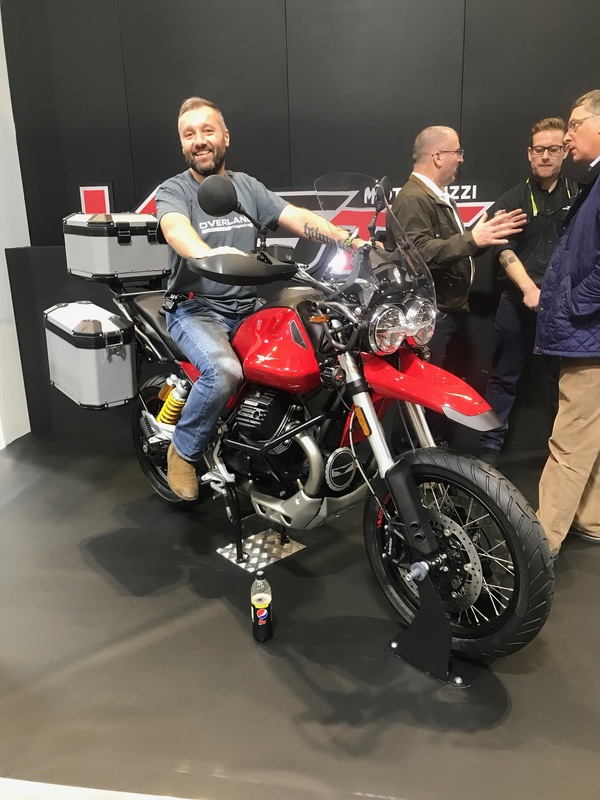 Next up was the Moto Guzzi V85TT, not a bike I liked the look of until I saw it in the flesh. In it’s bright red livery with yellow rear shock and black engine the V85TT looked stunning in the flesh. 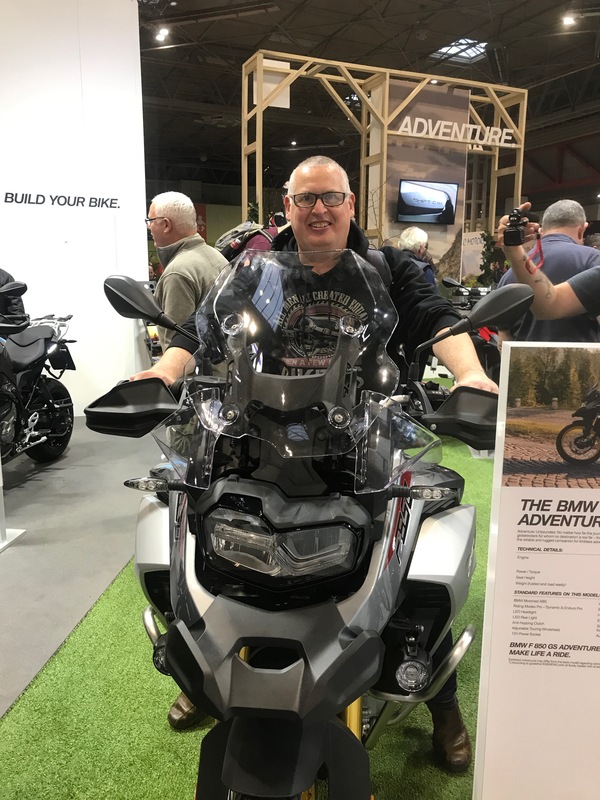 Weighing in at 207kg dry in standard guise with a lovely looking 850cc transverse V-Twin the V85TT really does make an interesting adventure bike. 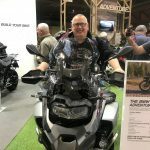 With all the kit fitted on the bike at the show the price was £15000 which takes it into the somewhat expensive end of the mid-range adventure bike spectrum. Once again, height was an issue, no contact with the ground for me once again and so another bike off the potential list. Passing by the Honda stand Dave and I made a beeline for the Monkey Bikes! These great looking little machines have a huge following globally and you can see why. Beautifully put together, retro styling and the most amazingly comfy seat in a tiny format that just makes you smile. these little bikes would be a scream off-road. Coming in a multitude of colours, there really is one for everyone! Could this be a potential bike for the trip? We certainly think so! 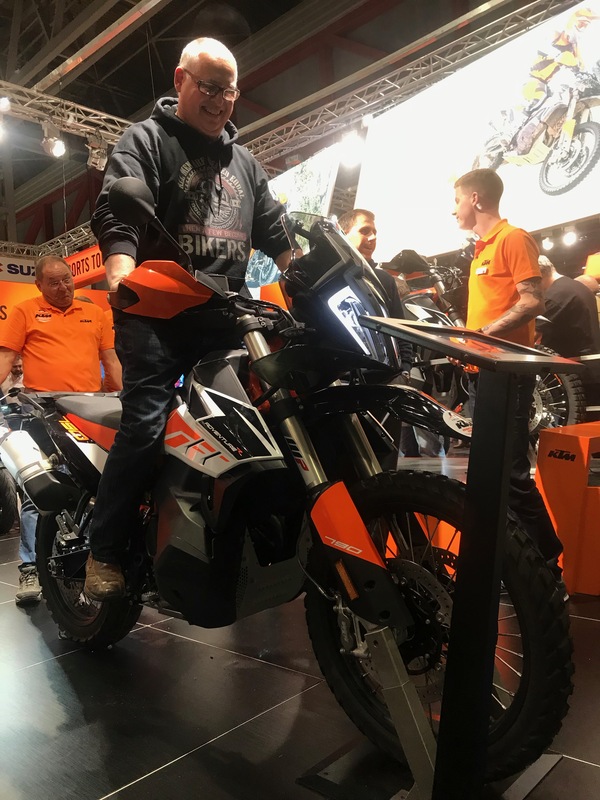 Next we made a beeline for the KTM stand and the new 790 Adventure. The stand was busy, probably one of the busiest we came across and the 790R was centre of attention. The striking colour and overall design of the new mid-weight adventure bike is breath taking. With its WP suspension, radially mounted brake callipers and futuristic headlamp the 790 has all the right components that we’ve been looking for. Climbing on the bike (more on this later) the seating position is perfect, bars are exactly where your hands fall naturally with a spacious seating position. Standing on the pegs the controls fall perfectly to hand with the tank providing a good knee grip stance. 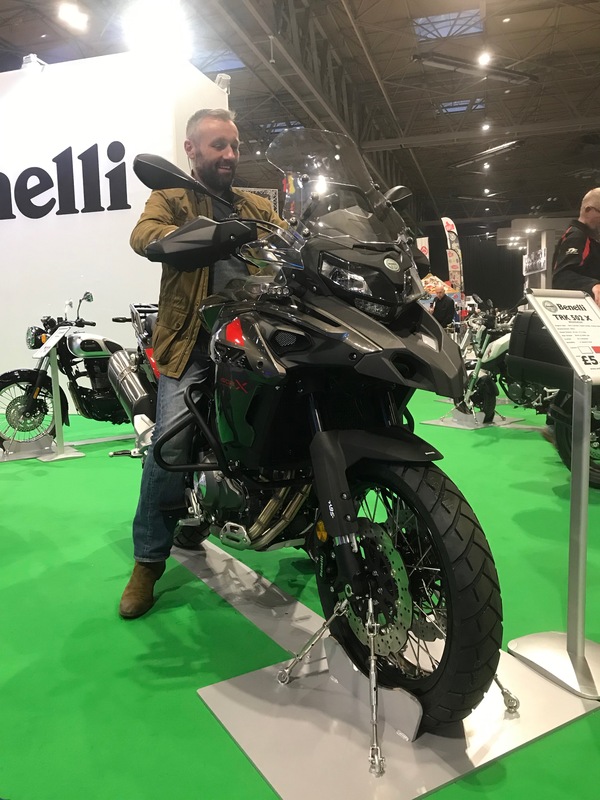 Overall I absolutely loved the bike and would dearly love to test ride one except for one deal breaking problem, yup you’ve guessed it, I couldn’t touch the ground! 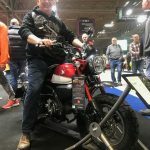 It seems to be the case now that unless you are 6ft tall with legs in the 34in+ department it’s impossible ride these new adventure motorcycles. Is the world really now full of people over 6 foot and I’m actually a 5ft8in midget? 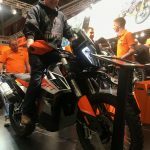 To say I left the KTM stand disappointed was an understatement. 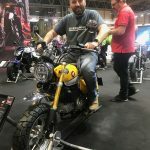 We dropped by to have a chat with Nathan Millward who rode his 105cc Honda CT110 from Australia to the UK and founded The Garbage Run Tours. 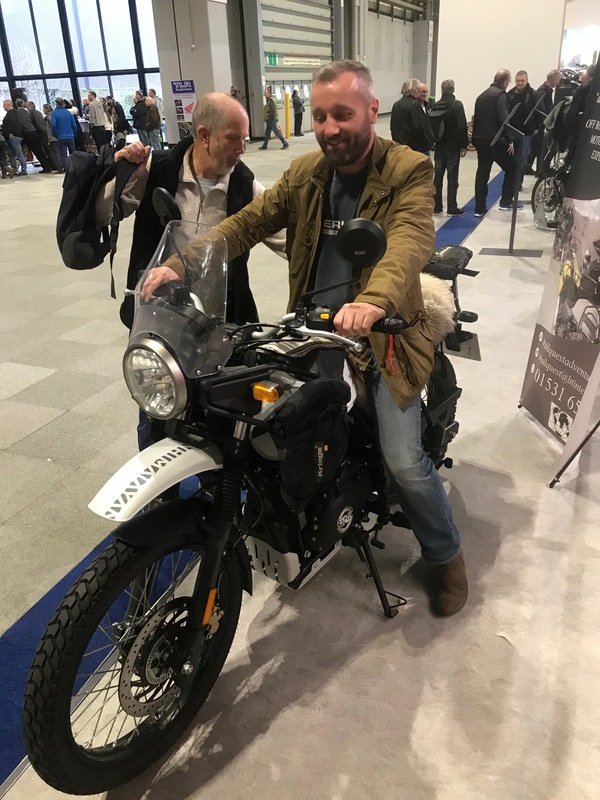 Nathan is a really nice chap full of useful information, so we took the opportunity to pick his brain on the Royal Enfield Himalayan, David’s bike of choice for the trip. Nathan had a well equipped example at the show which gave us plenty of ideas when it came to carrying all our kit. After a good 45mins we’d gleaned a lot of very useful information and tips from Nathan with his parting gift being “just get on and do it!”. 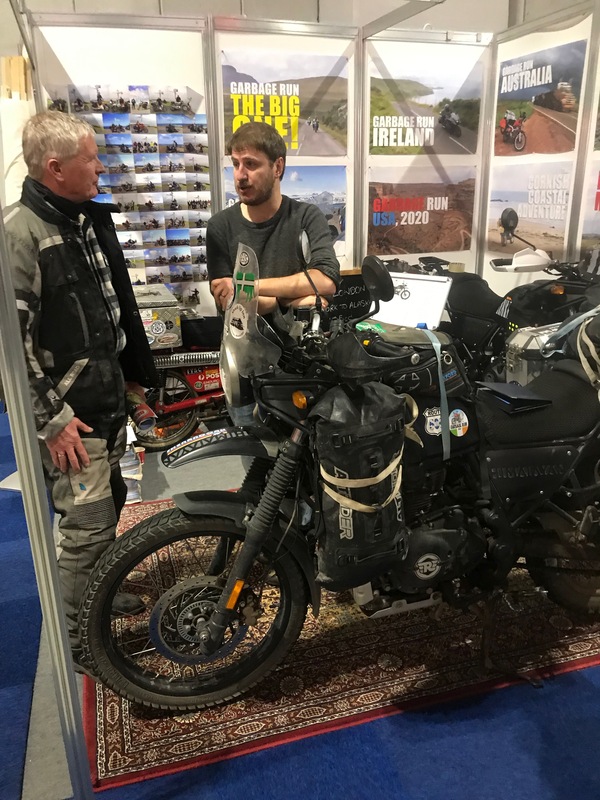 We also bumped into Sam Manicom at the Adventure Bike Shop stand, another extremely nice chap who again is extremely knowledgable when it comes to adventure riding. He also recommended reading “In Search of Greener Grass” by Graham Field so I’ve ordered a copy and will be making my way through it later this week. 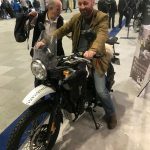 Of course we had to visit the Royal Enfield stand so that David could sit on his dream machine, the Himalayan. This is one adventure bike on which I can get two feet securely planted on the ground whilst sitting comfortably. The 411cc air cooled single cylinder bike weighs in at a hefty 190KG but on our recent 30min test ride the little long stroke engine pulled it along well. 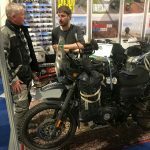 My only concern is build quality and reliability, other than that I do agree with David that it has the potential to be the ideal bike for the trip. 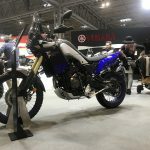 We’re hoping to have a full day test riding the Himalayan soon and so I’ll post an update on my thoughts then. The last bike I want to mention in this post is one that neither David or I had even considered, in fact I’m not sure we even knew of its existence. Benelli isn’t a brand synonymous with adventure bike riding but the TRK500 certainly looks the part. With it’s spoked wheels, 17in/19in combination, low sweat height and adventure styling the bike certainly looks the part. On closer inspection there is a lot of plastic up front that would be extremely vulnerable in a fall with rubber coolant pipes dangerously exposed to the elements on the left side. Sitting on the bike it was extremely comfortable and I made good contact with the ground, something of a rarity on new bikes these days. The switch gear felt a little on the cheap side but the rear rack was one of the most solid I’ve seen in ages. Could it be a potential bike for the trip? 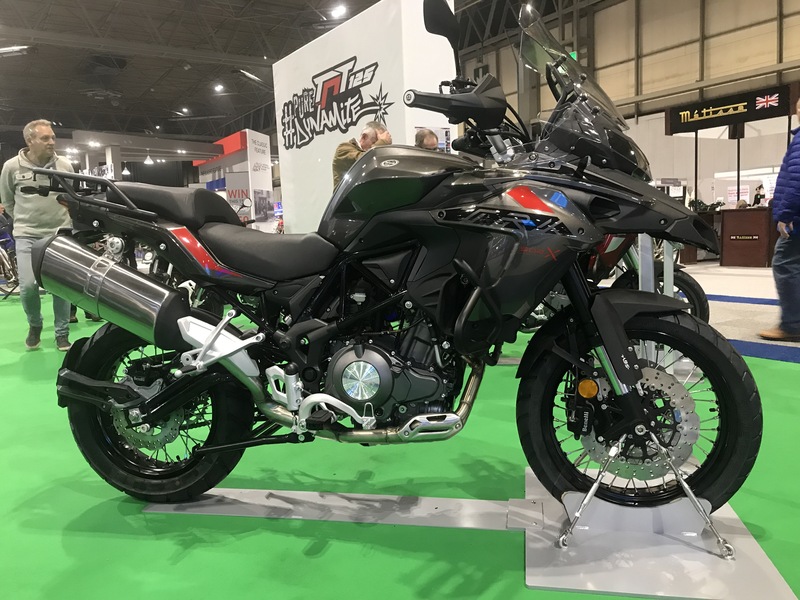 Well if the MCN write up is anything to go by I doubt it very much, a shame because it is a good looking machine that has potential.